It's curious as to why there is such little documentation of Anne’s monarchy. We've seen the BBC's The Tudors and The Virgin Queen, as dramas frequently rehash the lives of Henry VIII, Elizabeth I and Mary, Queen of Scots – but never, or rarely, Anne Stuart. Perhaps it’s because, despite being peppered with controversy toward the end, Queen Anne’s short reign was not hugely eventful. 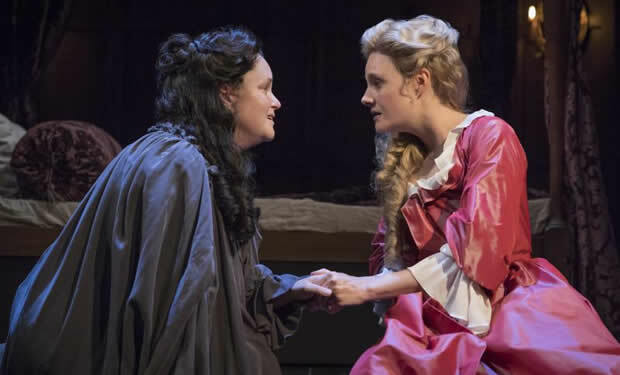 Originally premiering in 2015, Helen Edmundson's new, superbly gripping play Queen Anne does all it can to remedy that, ensuring that her history is fully charted. After a tumultuous ascendancy to the throne, the production follows sickly Anne's relationship with her council, in particular the jealous ears of the Marlborough's, who are determined to manipulate the Queen to their own advantage. It lightly touches upon the close relationship of the Queen and Sarah Churchill, later Duchess of Marlborough. Theirs is a tight-knit friendship, but one that is apparently one-sided and bubbling with a lust that is never fully fleshed out. Edmundson's script is incredibly suggestive, without actually dipping in to potential goings-on, as Anne claims Sarah has her whole heart. Emma Cunniffe gives a revelatory performance as Anne, clutching at herself and her sicknesses, and transforming from a nervous wreck in to a self-assured monarch. Romola Garai as Sarah is instantly unlikable; she's loud, stubborn and strikingly insincere, and it's tricky to feel any sympathy for her inevitable demise. Beth Park gives a strong performance as Abigail Hill, the cousin of Sarah who ultimately gains the Queen's trust, whilst James Garnon provides much of the limited comic relief as Robert Harley, Speaker of the Commons who later rises to Lord Chancellor. Natalie Abrahami's direction ensures the piece moves along swiftly, and with a running time of almost three hours, it's an admirable feat. Hannah Clark's gloomy design marks no specific location, but sets a dark atmosphere that contributes to the play's sinister undertones. For most of the play, you are watching through the Queen’s eyes; who can you trust? And whilst everyone works to gain the Queen's ear for their own purpose, is anyone truly trustworthy? There's a smattering of political references that garners knowing chuckles; the threat of Scotland leaving, the rise of the Tories – although Anne's appointment of the Tories in cabinet threw out much of the incredibly right-wing Whigs. For those who are enthralled by history, Queen Anne certainly fits the bill. But those looking for a wildly entertaining night at the theatre should steer clear; it's rather more of a history lesson than a jolly romp. 10 July 2017 - "superbly gripping play"